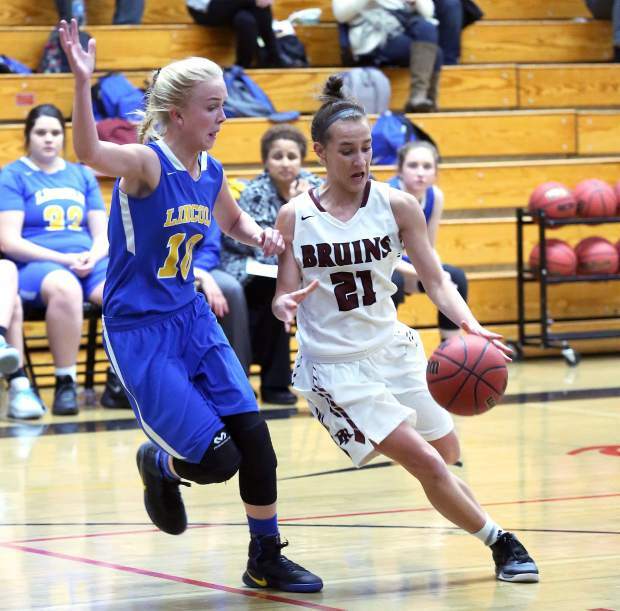 Katelyn Meylor Basketball Bear River senior guard Katelyn Meylor has impressed this past week, helping the Lady Bruins win one tournament and get off to a strong start in another. Meylor scored 18 points, nabbed seven steals and pulled down six rebounds to lead the Lady Bruins past El Camino in the Lois Langford Tournament Championship last Saturday. Meylor was also strong in the Durham Trojan Classic opener on Thursday, scoring 21 points and grabbing six steals in a win over Colusa. Bear River senior guard Katelyn Meylor has impressed this past week, helping the Lady Bruins win one tournament and get off to a strong start in another. Meylor scored 18 points, nabbed seven steals and pulled down six rebounds to lead the Lady Bruins past El Camino in the Lois Langford Tournament Championship Game last Saturday. Meylor was also strong in the Durham Trojan Classic opener on Thursday, scoring 21 points and grabbing six steals in a win over Colusa. For the season, Meylor is averaging 17.8 points per game, 5.8 rebounds per game and 5.2 steals.